Urban logistics is just one of the many challenges facing our cities. After Copenhagenize worked for three years on the European Union project Cyclelogistics, we have cargo bikes on the brain and provide cargo bike logistics as one of our services. We also live in a city with 40,000 cargo bikes in daily use. As ever, we look for solutions not only for other cities, but our own. During the Cyclelogistics project we determined that there is a massive potential for shifting goods delivery to bikes and cargo bikes. 51% of all motorised private and commercial goods transport in EU cities could be done on bicycles or cargo bikes. Great. Let's do that. But how to do it best? Lots of small companies are already operating in cities with last-mile service for packages, which is great. DHL is rocking Dutch cities with cargo bike deliveries and UPS and FedEx are getting their game face on, too. But we need to think bigger and better. 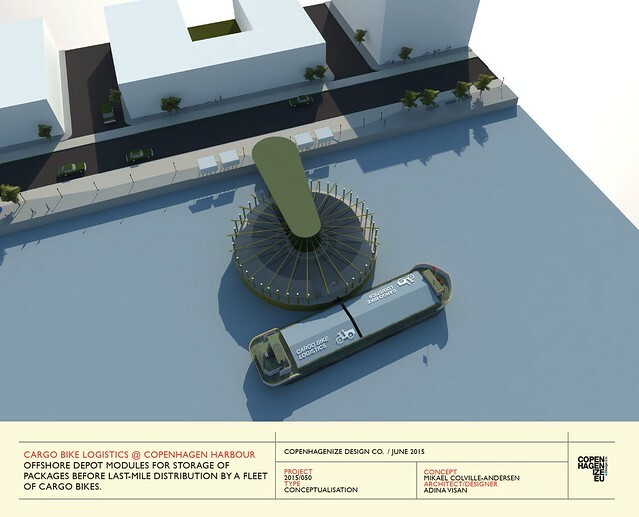 The City of Copenhagen created the framework for the idea of setting up a consolodation centre south of the city where logistics companies could drop off their goods in their larger trucks. Last mile service could be provided by smaller vehicles so that the trucks stay the hell out of our city. The industry has been slow to pick up the baton, however. Sådan virker Citylogistik from Citylogistik on Vimeo. There are a lot of packages to be delivered to the citizens in cities. In the Netherlands, for example, over half of all shoes are bought online. That is a lot of shoeboxes needing to get out to the people. In Europe we speak of the Zalando effect - similar to Amazon in North America. Last mile service by smaller vehicles is great for cities but what about the solutions that are right there under our nose? What about the most ancient of transport corridors in our cities - the rivers and harbours. 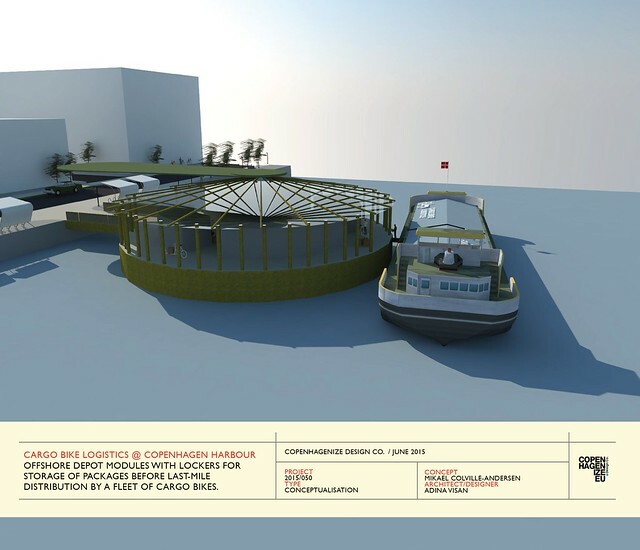 We at Copenhagenize Design Company propose having barges - electric if you like - plying the waters of Copenhagen harbour. Dropping off small goods at specially designed piers at strategic locations on the harbourfront. Secure facilities that keep the goods stored in lockers. 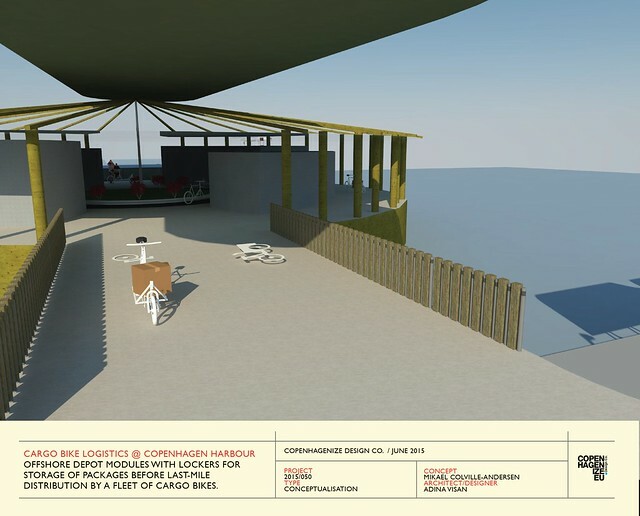 Depots designed especially for cargo bikes to arrive and pick up goods - or drop them off - in order to deliver them to the people and businesses in the various areas and neigbourhoods. Our urban designer Adina Visan took our idea to the visual stage. 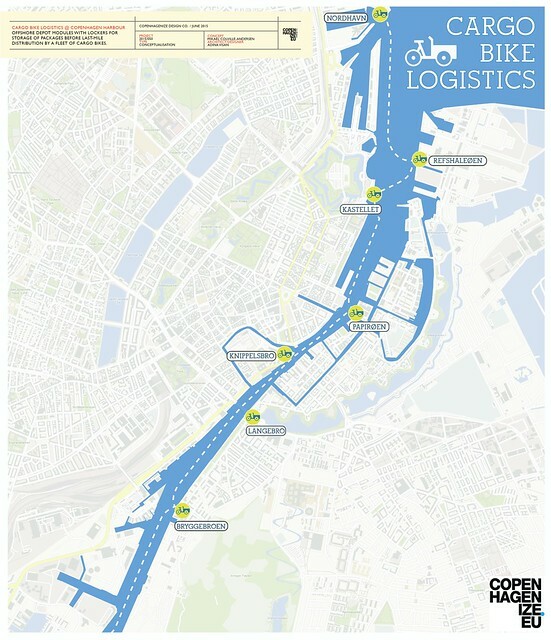 Envisioning iconic off-shore depots for urban logistics along Copenhagen Harbour - or any city with a harbour or river. This should be the new normal for goods delivery in Copenhagen. Depots arranged to serve the densely populated neighbourhoods on either side of the harbour. Designed for a fleet of cargo bikes that can roll in, pick up goods in lockers, and roll out again onto the cycle tracks of the city.